FedEx is forecasting a 13% increase in the shipments it handles this holiday season, largely due to a jump in online spending. The forecast of 280 million shipments would be a record number of packages for the Memphis-based delivery company. FedEx expects to hire 20,000 seasonal workers to help with the holiday surge, about the same number it hired last year. The company has about 300,000 permanent workers worldwide. In September, FedEx cut its fiscal year earnings guidance, saying slow global growth was driving customers away from the more expensive overnight services. 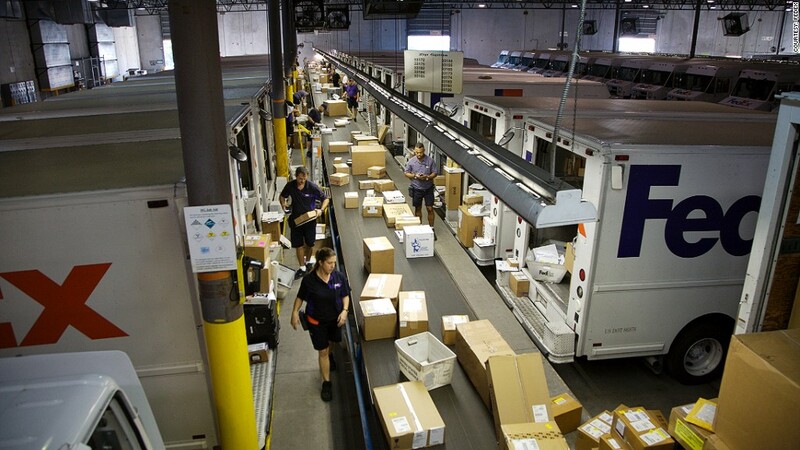 FedEx's (FDX) forecast for shipment growth is stronger than the National Retail Federation's estimate of a 4.1% increase in U.S. consumers' spending this holiday season. But FedEx's anticipated rise in packages is slightly less than the 16.8% increase in online shopping forecasted by research firm eMarketer. FedEx rival United Parcel Service (UPS) has an edge with delivery contracts for some major online retailers, including Amazon.com (AMZN), but has yet to publish its holiday shipment forecast. It is due to report third-quarter earnings Tuesday, when it may give some guidance for the current quarter. The U.S. Postal Service said it expects to handle 17.9 billion cards, letters and packages between Thanksgiving and New Year's Eve, but it could not provide a comparison to last year.